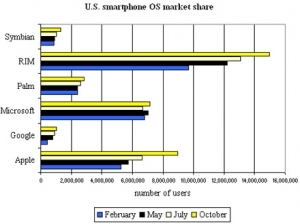 BlackBerry dominates US smartphone market in October | BlackBerry Blast! Despite all the claims that Apple is dominating the smartphone market, Comscore's survey says RIM's BlackBerry OS actually dominates in the US. Comscore conducts monthly surveys of U.S. wireless subscribers over the age of thirteen. Of the approximately 36 million smartphone users, about 15 million of them use a BlackBerry devices. That means that RIM has about a 41% marketshare in the US.